Specific challenges for SAR include skills and capacities of localisation, stabilisation, evacuation in all terrains (water, mountains, remote and non-accessible areas) and all contexts (transportation accidents, disasters, etc.). In EMR – for the same range of contexts and terrains – challenges include triage, trauma and life support, decontamination of people, large number of victim s’ management (mass rescue organisation, field hospitals), transport to safe areas (ground and air transport), fatalities management. The thematic is transverse and not specific to a certain context. It concerns first responders and rescuers, as well as medical and ambulance services or civil defence units. The first workshop for Thematic Working Group A. Search and Rescue (SAR) and Emergency Medical Response (EMR) was held in Barcelona from the 21-23 March 2018. The workshop was hosted by the Department of Interior in Barcelona and organized by the Bombers of Generalitat of Catalonia. 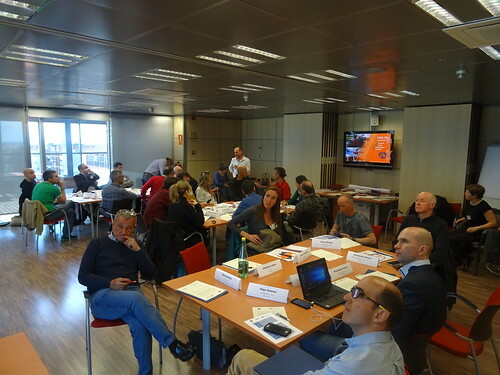 Twelve experts from 7 countries (Italy, Spain, France, Czech Republic, Germany, Andorra, and Greece) discussed the gaps that need to be defined in order to improve the operational capability and safety of rescuers in search and rescue and medical emergencies. The group used two hypothetical scenarios: (1) an airplane crash in the mountains and (2) a search and rescue in a cave, to discuss the cooperation between different EU countries to address these kinds of emergencies.